Squarespace is one of the most respectful and recognizable website builders you can come across these days. It can be used for the development of literally all types of websites, but there is one problem most users encounter when deciding to work with the system. Despite Squarespace’s functionality, it is far from being an easy and understandable tool for users, whose web design skills are not on the best level. And it’s no wonder as the system is mainly geared towards the needs and skills of those users, who have an idea and experience of working with suchlike programs. When launching a website with Squarespace, you’ll inevitably face the need to explore and master all those complicated menus, submenus, categories, tools and other elements the system comes with. As a result, it’s now always easy to master all the nuances of working with the service, especially if you are the first-time user. This is one of the major reasons that make Squarespace users look for simpler alternatives based on their specific requirements and web design objectives. Suppose, you’ve decided to use a website builder to establish impressive web presence. Which service will work best for your personal or commercial needs? Which of them with comply with your major requirements, ensuring the result you’ve initially planned to reach? Below, we are going to review four most popular Squarespace alternatives that will certainly come up to your expectations. 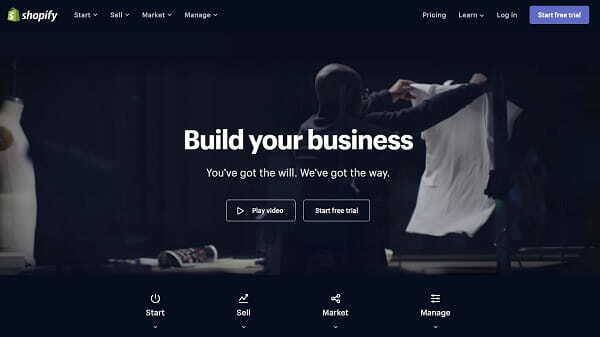 These are Wix, uKit, Shopify, Weebly and WordPress – four web building platforms that do not require presentation and are currently considered the most popular in the web design industry. So, let’s meet TOP 5 Squarespace alternatives in details. Mobile-Ready Templates. The website builder excels at the quality and industry-division of templates offered. All of them are mobile-ready and have professional look. As of today, the system boasts over 550 templates, the number of which is being updated on a regular basis. Templates are the real pride of the website builder. As opposed to Wix, Squarespace cannot boast such an extensive template gallery, not to mention the quality and customizability of the themes. Customizability. Whatever design you will give preference to, you will come across multiple customization tools to give it unique and one-of-a-kind look. You’ll be able to choose between free and paid options that will have notable impact upon your design look (slideshow integration, cinemagraphs, graphic elements, design settings, media files and social network buttons integration are only some of the best samples to choose from). Design Editing Modes. Wix offers two powerful design editing modes, each of which meets the needs of diverse user categories. These are Wix ADI and Standard Website Editor. With the Artificial Design Intelligence tool, even a newbie will easily be able to create and then manage a website with no hassle and waste of time. This is because the system automatically does that for you based on the business info you submit. If your web design skills are on a decent level, then it’s preferably to select a Standard Website Editor that lets you manually edit your template design, thus improving your professionalism. Mobile Editor. If you wish your website to be available in the mobile mode, you can make the edits in its mobile version. This is done in the control panel with a few clicks any time of the day. Mind that the edits you make in the mobile mode are not seen in the major desktop version of your website, while those you make in the desktop mode are immediately displayed in the mobile version. Blogging. Wix has an integrated blogging platform, which allows adding and editing the posts, assigning special settings and characteristics to them, scheduling publications, creating Featured Posts section, adding tags, choosing and customizing blog feeds or templates etc. App Market. Wix App Market is the place, where you can find hundreds of free and paid applications to meet any preferences and needs. Whatever niche you specialize in and whatever website type you plan to launch, you will surely be pleased to integrate quality apps from here. As of today, Squarespace cannot offer this feature. eCommerce Engine. Wix makes it possible for each user to launch and manage small and medium online stores. By using the system, you can design impressive show windows to display your digital or physical products and services, manage and update the store 24/7, adjust payment and shipping details, modify tax settings, choose and customize eCommerce templates, import/export products from the CSV file (this is done manually) etc. Free Forum Builder. Just like it is possible to add a blog or a web store to your website, it is not a problem to connect a forum for free to it as well. While Squarespace doesn’t have this tool, Wix offers such an opportunity, which increases the value and reputation of the website builder. Wix Code. Even though Squarespace is mostly oriented on professional web developers, Wix does not lag behind it in terms of functionality. The Wix Code tool makes it possible for newbies to create functional web applications to further integrate them into their projects. What’s important, the feature doesn’t imply any coding awareness or web design knowledge – everything is simple and intuitive here. SEO Wizard. Wix SEO Wizard allows improving your search engine optimization results by tracking the available weak points and outlining strong ones. This is how you will know, if your website is ready for publication and what measures should be undertaken to improve its SEO ranking. Currently, Squarespace doesn’t have a similar alternative, which is a serious drawback of the system. Cost: When it comes to the cost aspect, Wix has a notable benefit over Squarespace in this respect. The thing is that Wix has a free plan, which makes it possible not only to test the major features of the service, but also to create simple websites to improve your web building skills and expertise level. The free version of the system is unlimited. If you wish to get the most out of your website, you are welcome to upgrade to one of the paid plans, starting from $4.50/mo. WYSIWYG Website Editor. uKit is initially known for its advanced website editor that lets you see and control all the edits you make at the web page to be able to fix them on time. User Interaction Tools. To get in touch with users and help them solve their problems, uKit offers a set of interaction options via the usage of specialized tools and widgets (Callback Forms, LiveChat Widget, MailChimp are the best samples in this respect). This boosts customer trust and your website credibility. CRM Integration. If you are right about to launch a business website, you won’t go without CRM Integration feature and the benefits it offers. This is a perfect tool to control client relations, project profitability, its statistics as well as manage business tasks and orders without leaving the system. This matters a lot for eCommerce websites. Template Collection. uKit template collection currently encompasses about 400 themes, all of which are responsive and professionally-designed right from the start. You can browse between several sections that are thematically-focused, customize the selected designs and even change them during the web building process, if you feel that you’ve initially made the wrong choice. Widget Integration. The website builder makes it possible to select and integrate multiple templates into your project based on its specialization and web design tasks you set. The system currently offers dozens of widgets, integration of which requires a few clicks only. These are widgets of social networks (Facebook, Instagram, Twitter, Pinterest etc. ), Media Widgets (SoundCloud, SlideShare, Video, News, Timer, Steps etc. ), Contacts (Callback Forms, MailChimp, LiveAgent, LiveChat, JivoSite, Cost Calculator – uCalc etc.). eCommerce Functionality. With uKit, you can create a small-to-mid eCommerce website in one of two effective ways. The first one implies the connection of the eCommerce widget to the website, while the second one allows integrating the Ecwid plugin into the existing website to give it eCommerce focus. Temporary Website Management Access Rights. Most web design agencies practice teamwork when dealing with custom-ordered projects. To get the most out of this collaboration, uKit lets you share temporary website access rights (they don’t extend longer than 999 days) with other team members. An important issue is that the right-holders don’t have access to billing or payment information (it is you, who is responsible for this info storage), but they will be able to make changes for effective project development and promotion. Cost: uKit offers a 14-day free trial version of the plan you would like to test. Paid plans will certainly fit into your budget, due to their affordability and rich feature set included. The cost of the cheapest plan constitutes $4/mo, while that of the most expensive subscription is $12/mo. Thus, uKit pricing policy is more than affordable for everyone and it is definitely much cheaper as compared to Squarespace plans. POS Software. The Point-of-Sale software is one of the highlights of the system most users pay attention to, when deciding to start their web-based businesses. The tool makes it possible for local entrepreneurs to sell their services and products not only in the online mode, but also in local retail storefronts. This eventually helps extend the customer base of the system. Responsive Designs. Shopify excels at high quality, well-structured, responsive and 100% customizable templates. They fall into thematic niche categories based on the web store specialization. The designs are free and paid, but this doesn’t have notable impact upon their quality and impression they make upon customers. Marketing Opportunities. The eCommerce software makes it possible to use a set of marketing tools to help you get the most out of the website statistics, performance evaluation, customer and order tracking, client control, web store settings adjustment, enhancement of customer engagement rate and business profitability in general. Powerful Synchronization And Integration Options. Shopify is ready to offer its clients a set of powerful and effective integration and synchronization tools and options. By integrating your Shopify account with those of Xero, Amazon, Quickbooks and other external services, you will be able to contribute to successful and quick promotion of your projects. Engaging Product Presentation. To boost customer engagement rate, Shopify allows presenting and displaying digital or physical products they offer in a variety of show window variations. They also introduce special measures to get the most out of product presentation. Thus, users are offered to try the Augmented Reality Feature, detalization of product reviews, creation of appealing video and image collections etc. Security Aspect. As the advanced customer-oriented eCommerce software, Shopify initially cares a lot about user safety and preservation of confidential data. When launching a web store, it is important to make sure your payment and personal info are protected from unauthorized third-party access. With Shopify, you can connect the SSL Certificate to your website, integrate Fraud Protection Feature, make use of the system Shopcodes, Tag and Chip Reader and other safety protection tools. Cost: The service offers a free 14-day trial, during which you can try all its features. The number of paid subscriptions currently constitutes 4 plans. You’ll have to pay $9/mo for the cheapest plan and $299/mo for the most expensive subscription. There are no extra transaction fees here, but the system charges money for the credit card payments made with it. At the same time, Shopify frequently has discounted offers for first-time and loyal users, which may sometimes cut down the subscription cost by 8-10%. Strong eCommerce Accent. As of today, the system provides a set of eCommerce tools and features (CSV product file export/import, inventory management, order and inventory tracking, physical/digital goods, flexible shipping options, integrated shopping cart, coupon codes, filtered product search, mobile store, simple and convenient product upload and management process) that make it highly competitive in the web building niche. App Center. The website builder has an App Center that quickly develops and offers an opportunity to integrate functional widgets, add-ons, extensions etc. into a project to boost its performance. Effective Email Marketing. The feature makes it possible to get the most out of email marketing option Weebly provides. By using the platform, you can keep your customers aware of the recent news, updates, special offers and other website-related events. Template Customization Options. The system doesn’t have hundreds of templates in the catalogue (as opposed to its major competitors), but those that are included into thematic categories are worth the attention due to their high quality, 100% customizability and responsive nature. If you wish to make use of your coding skills, you can edit one of the available templates to give it more advanced design or even integrate your own template, if you have the one. Team Website Management. The system allows sharing website access rights with those team members you plan to work with on the project. Blogging. With Weebly, you can launch and manage a full-featured blog either for personal or business use. What you can do here is add and edit blog posts, set up the commenting feature and management tools, design blog template and layout, develop post structure etc. Cost: Those, who plan to develop a standard website, may choose between five subscriptions, which range from a free plan and up to the most expensive Business Plan ($25/mo). Users, who have an intention to use Weebly for eCommerce web building purposes, are offered an opportunity to select between four paid plans. The cost of the cheapest subscription currently constitutes $8/mo, while that of the most expensive Performance Plan will cost you $38/mo (with the annual payment). Plugin Integration. Even though, WordPress has a collection of integrated pre-designed plugins, there are still dozens of them available on the web. If you can’t find the stock plugin, you are welcome to browse the Internet to choose between those of them developed by other web designers. The plugins are free and paid. Mind that free plugins are often less secure than paid ones as they may contain malicious codes, which may potentially threaten your website safety. At the same time, you should always mind your choice, irrespective of the plugin you go for. Blogging Engine. The CMS is a world-known blogging platform, which is no wonder as the system was initially created with blog development purpose in mind. However, it has quickly become the all-in-one solution for users willing to design other project types on a decent level. Template Selection. The situation with templates resembles that with plugins in WordPress. The system has a collection of ready-made themes, but their amount is too small to come up to the needs of all users. They also have similar look, which is not desirable, if you wish to be able to withstand niche competition. Thus, if you need more advanced and versatile WordPress themes, you are welcome to surf the web to get them there. Again, mind the personality of the web designer you deal with. Website Code Editing. To give your website advanced design and to make it stand out from the crowd, it is a must to possess at least basic programming skills. If you lack them, don’t expect much from the quality of the project – this is not to mention the inability to manage your projects afterwards. Hosting Choice. As far as WordPress doesn’t offer integrated hosting right from the start, it provides you with the freedom of choice. Shop around to find suitable offers. Powerful and Supportive User Community. While the system doesn’t offer customer support by default, many users find it complicated to search answers to their system-related questions. This is where extensive, supportive and powerful user community will be of great help. There are lots of topics discussed here every day. No matter what your question or problem is – you will surely have it solved here for free! Cost: WordPress is a free open-source CMS, which is now used to design multiple simple-to-complex projects. If you intend to launch a more powerful project with WordPress, you won’t go without integrating paid templates, plugins, widgets, add-ons and extensions. Don’t forget about your website domain and hosting. Mind that WordPress doesn’t have integrated hosting solutions, but it officially recommends you to deal with Bluehost. This is a trusted hosting provider with lots of features, services and tools available in several plans. At $2.95/mo only, you get an almost unlimited hosting and a bonus domain name with Bluehost. Isn’t that a worthy offer? Squarespace is one of the most recognizable and professional website builder, which is mostly created to fit the needs of web design experts, who work on the development of complex personal and custom-made projects. However, when it comes to inexperienced users, the system does not have much to offer. This is when they face the need to look for simpler Squarespace alternatives that also ensure great result without requiring the knowledge of coding skills. Wix is the best all-in-one website builder, which prevails over Squarespace in terms of quality, cost and efficacy of the web development process. Whatever website you plan to launch and whatever your web design skills are, Wix is a surefire way to gain success. uKit is the cheapest substitute to Squarespace, which is mostly applied to design small business websites. The feature set of the system, however, allows using it for the development of other projects that reveal quality, functionality and visually appealing responsive design. Shopify is the best eCommerce alternative to Squarespace. The abundance of eCommerce features, customizable responsive templates, lots of marketing, promotion and web development options make the service the renowned leader of the contemporary eCommerce niche. Weebly is a trusted website builder, which can be effectively used by two types of users: those, who intend to design standard projects and those, who have an idea to build small eCommerce websites. The service comes with powerful niche-specific tools, advanced customization features and several template design options. WordPress is a free open-source CMS, which makes it possible to create and update small-to-complex projects, yet implies the awareness of coding basics to get the most out of its full potential. What’s the best alternative to Squarespace? It all depends on what you want to get out of your site, how in-depth you want to be able to customize it, and how much you are willing to pay for it. Try all of these Squarespace substitutes and make your choice.